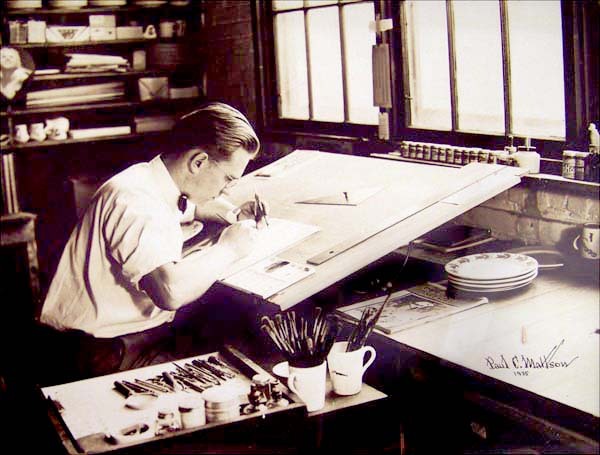 Paul C. Mattson, right, shown at work at his drawing table, was a designer for Carr China from 1934 to 1937. His daughter, Judy Reed, has a collection of his work from his time with Carr that includes vitrifed ware, sample boards and miscellaneous ephemera. She agreed to let Bill Montgomery photograph the group, and those have been added to this page. In addition, a few other examples exist with the Mattson signature, a distinctive M. These include the Club Cassano plate and the Sea Foam pattern, both from Bill's collection, and a couple of floral designs from ours, and so noted. It is believed that anything backstamped with a version of Mattson's signature was a sample. What we're referring to as sample boards were made of cardboard and measured about 12" x 18". They had white circles embossed on them, the size of a dinner plate, and it was on these boards – also embossed with Carr China Co., Grafton, W.Va. – that Mattson would draft new designs. After his time with the Carr plant, Mattson began work at West Virginia Glass Company in Weston and continued to sign his pieces with his M.
As a personal note, it is obvious from looking at these pieces of Mattson's work that he was a gifted artist, and it seems that not all of his designs were approved for manufacture. That's a shame.